Jo and I have not long returned from an eight-day break down in beautiful Devon and Cornwall, touring gardens, sampling the regional cuisine (particularly the ice cream section of the menu) and quaffing a few of the local ales. I’ll be talking more about the rather wonderful gardens we visited – RHS Rosemoor, The Lost Gardens of Heligan, Hartland Abbey, Docton Mill, Baddesley Clinton, Barrington Court, Trelissick, Glendurgan and Cotehele – in later blog posts. We got back to Plot #59 to find that weeds had sprung up everywhere (of course), Jo’s flowers were blooming (you should have seen the A-frame of sweet peas before we picked them…) and, most of our edible Allium crops were ready for harvesting. 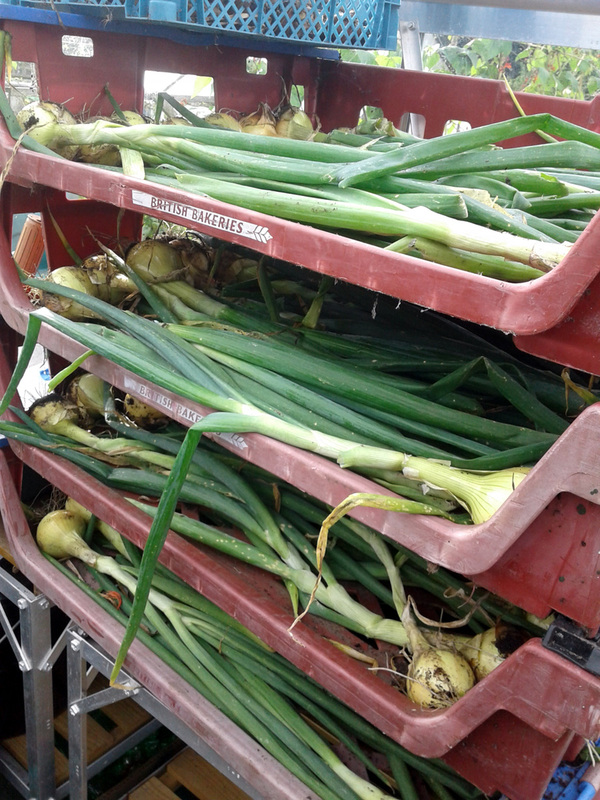 June and July are the best months, depending on the weather, for lifting and drying the edible members of the Allium family – onions, garlic and shallots – before putting them into store for autumn and winter. This year we grew all three, and through a combination of plenty of sunshine, tempered with occasional bouts of rain, they’ve all done rather well. This year we grew ‘Sturon’ from sets. I did sow some other varieties from seed back in January or February but they didn’t do too well, so I’ll have to try those again next year. Unfortunately, our plot has a pretty endemic problem with onion white rot. The best advice is to not re-grow alliums anywhere that’s suffered white rot, but as that could be anywhere, for the past couple of years we’ve just planted anyhow and taken our chances. Four trays of pristine onions drying in the greenhouse. 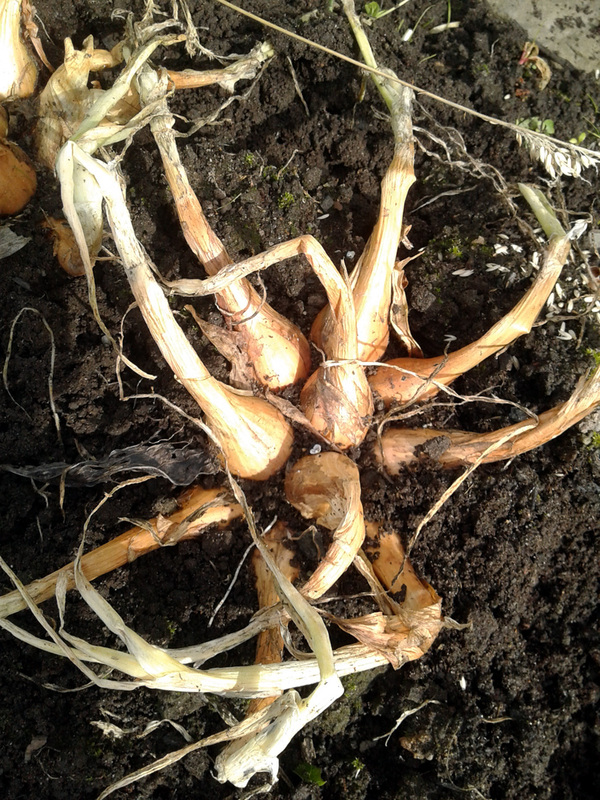 The bulbs that have any sign of white rot have been temporarily quarantined out on the surface of the onion bed. When I have a bit more time at the weekend, I’ll clean each one up, removing any infected material, and then assess them for usefulness. If they’re edible then we’ll use them as soon as possible, otherwise they’ll go in the bin, rather than the compost heap. 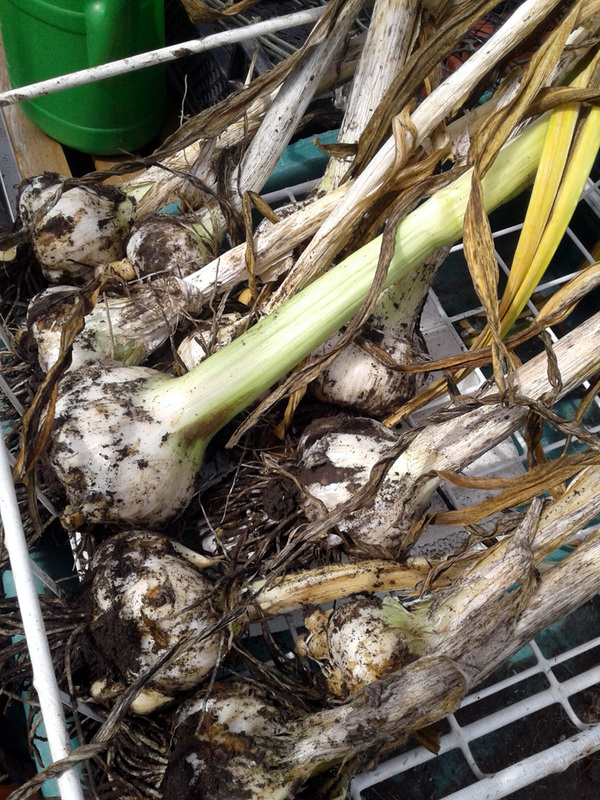 These bulbs are all showing some signs of white rot and will need careful cleaning. Plenty of shallots on this clump, they’ve divided and grown quite well. 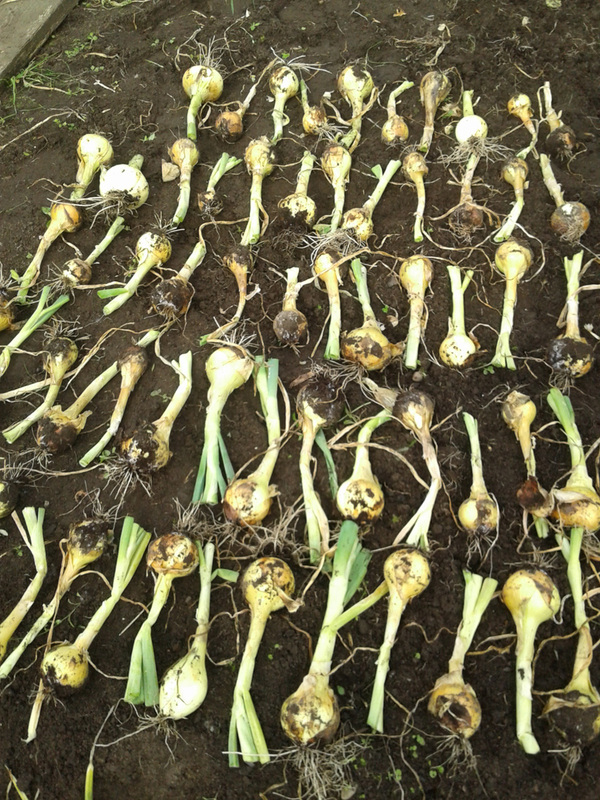 Two varieties of shallot laid out for drying. Edit: Guru Glyn says: “On the left, ‘Hative de Niort’, on the right, ‘Jermor'”. We’ve always had mixed results with garlic and this year was no exception. 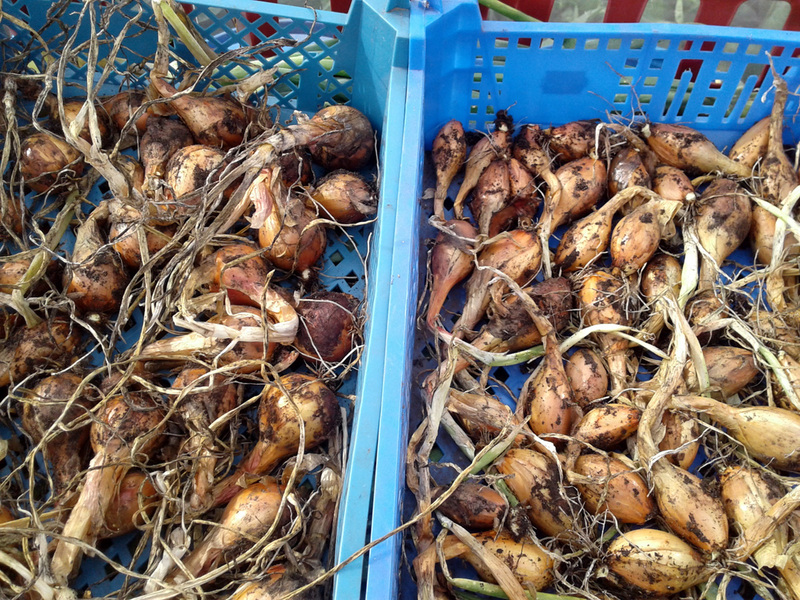 Back in October we planted three cultivars: Extra Early Wight, Red Duke Wight and Elephant Garlic, with two rows of the latter, one of seed cloves from The Garlic Farm and one of our own, plot-grown cloves. Both the Extra Early and the Red Duke started developing allium rust back in May and by the end of June it had completely covered the plants, killing off the outer foliage, preventing photosynthesis and effectively halting the growth of the plants. VAriety: Extra Early Wight. Yield: good enough. But the Red Duke was next-to-useless; small, barely-divided bulbs good enough only for chucking whole into winter stews, or saving to use in next year’s garlic spray. The elephant garlic, interestingly enough, managed to avoid the rust problem completely. The outer foliage died back and dried up, as you’d expect, but there were no signs of the orange pustules that affected the other two, despite them being grown next door and so within easy infection distance. 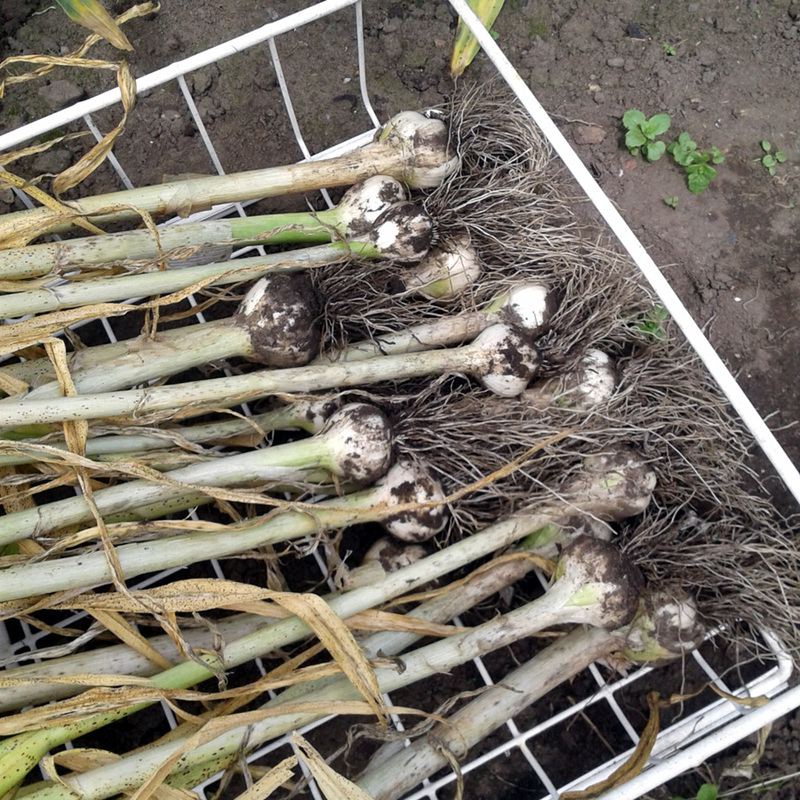 Elephant garlic grown from the Garlic Farm stock bought last September. I’ll wait to lift the second row before I make a firm decision, but I think this year I’ll just re-plant from our own stock, rather than spend extra money on bought-in cloves, which do tend to be rather pricey. How have you done with your edible Alliums? Do let us know, via the comments below, or on Twitter.